While attending Tucson High School, Bill Lenoir placed first in the National High School Tennis Championship singles in 1959 (defeating Arthur Ashe), and again in 1960. At the University of Arizona (1962-64) he was first-team Tennis All-American, with the school placing 3rd, 4th and 5th in the nation. The nationally ranked tennis player and University of Arizona college scholarship player coached college tennis from 1968-71 and was tennis pro at the Chaparral Racquet Club in Scottsdale from 1974-84. He refereed for several years for the Fiesta Bowl Junior Tennis Tournaments (some of the participants being Agassi, Chang, Sampras, Austin, Pierce). He was named “Athlete of the Year” in 1959 by the Arizona Daily Star. 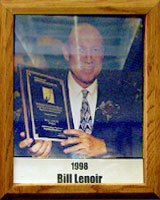 Bill also was named U.S. National Junior Tennis Champion (1960) and Orange Bowl Jr. Tennis Champion (1960). Bill has produced many state high school champions, nationally ranked players and college scholarship players throughout his coaching career. He has been a USPTA member for more than 25 years.